If you’re counting on ISO 9001:2008 to provide real value, not just add cost and bureaucracy, we can help. We’ve discovered after many successful implementations that ISO 9001 can add real benefits, such as improved customer satisfaction, reduced paperwork, decreased scrap and better product quality. The secret, of course, lies with how it is interpreted and used in your company. To help you make the most of your ISO 9001 implementation, we have developed the Scripted Flowchart Process that you can use as a starting point to document your procedures and improve your processes. Download a sample flowchart, 740 Purchasing Procedure, which uses The Scripted Flowchart Process™ [pdf]. The Scripted Flowchart Process forms the heart of our ISO 9001 Survival Software Templates product, which will help you jumpstart your own certification. The most important thing for your business system is to reflect what is currently happening in your company. Then your procedures can be changed to adhere to ISO 9001 requirements and reflect identified process improvements. The Software Templates include examples for the individual’s better understanding of how a process might be presented with the Scripted Flowchart Process. Since the templates are in Word they can easily be modified and should be, since all companies’ processes are different. Our ISO 9001 Survival Software Templates include examples of all the procedures required for an effective QMS. Forms you can modify as needed are included with most of the procedures in the templates. The 740 Purchasing Procedure includes a Supplier Approval Checklist. 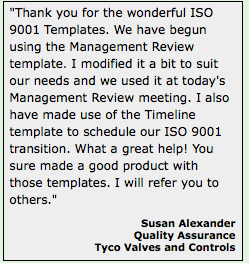 All the best to you with your ISO 9001 efforts. Please keep us in mind for assistance. We offer help that varies from our Survival Guide and software templates to coaching programs that provide personalized support to full implementation.